When high-mass (>= 8 Msun) stars end their lives in blinding explosions known as core-collapse supernovae, they can rip through the fabric of space-time and create black holes with similar masses, known as stellar-mass black holes. These vermin black holes dwarf in comparison to their big brothers, supermassive black holes that typically have masses of 10⁶-10⁹ Msun. However, as vermin usually do, they massively outnumber supermassive black holes. It is estimated that 10⁸-10⁹ stellar mass black holes are crawling around our own Milky Way, but we’ve only caught sight of a few dozens of them. As black holes don’t emit light, we can only infer their presence from their effects on nearby objects. All stellar mass black holes detected so far reside in binary systems, where they actively accrete from their companions. Radiation is emitted as matter from the companion falls onto the accretion disk of the black hole. Isolated black holes don’t have any companions, so they can only accrete from the surrounding diffuse interstellar medium, producing a very weak signal. That is why isolated black holes, which make up the bulk of the black hole population, have long escaped our discovery. Perhaps, until now. The authors of today’s paper turned the intense gravity of black holes against themselves. While isolated black holes do not produce detectable emission, their gravity can bend and focus light from background objects. This bending and focusing of light through gravity is known as gravitational lensing. Astronomers categorize gravitational lensing based on the source and degree of lensing: strong lensing (lensing by a galaxy or a galaxy cluster producing giant arcs or multiple images), weak lensing (lensing by a galaxy or a galaxy cluster where signals are weaker and detected statistically), and microlensing (lensing by a star or planet). During microlensing, as the lens approaches the star, the star will brighten momentarily as more and more light is being focused, up until maximum magnification at closest approach, after which the star gradually fades as the lens leaves. This effect is known as photometric microlensing (see this astrobite). Check out this microlensing simulation, courtesy of Professor Scott Gaudi at The Ohio State University: the star (orange) is located at the origin, the lens (open red circle) is moving to the right, the gray regions trace out the lensed images (blue) as the lens passes by the star, while the green circle is the Einstein radius. The Einsten radius is the radius of the annular image when the observer, the lens, and the star are perfectly aligned. Something more subtle can also happen during microlensing, and that is the shifting of the center of light (on a telescope’s detector) relative to the true position of the source — astrometric microlensing. While photometric microlensing has been widely used to search for exoplanets and MACHOs (massive astrophysical compact halo objects), for instance by OGLE (Optical Gravitational Lensing Experiment), astrometric microlensing has not been put to good use as it requires extremely precise measurements. Typical astrometric shifts caused by stellar mass black holes are sub-milliarcsecond (sub-mas), whereas the best astrometric precision we can achieve from the ground is typically ~1 mas or more. Figure 1 shows the signal evolution of photometric and astrometric microlensing and the astrometric shifts caused by different masses. 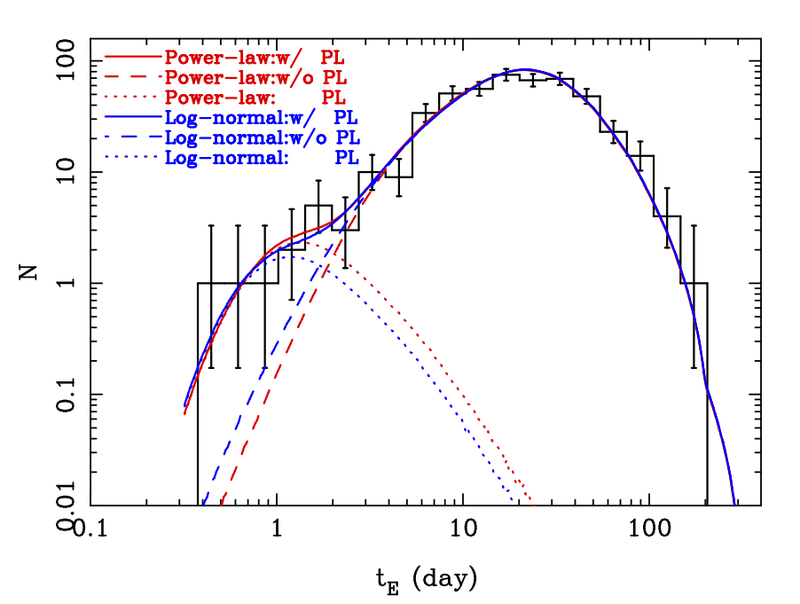 In this paper, the authors used adaptive optics on the Keck telescope to detect astrometric microlensing signals from stellar mass black holes. Over a period of 1-2 years, they monitored three microlensing events detected by the OGLE survey. As astrometric shift reaches a maximum after the peak of photometric microlensing (see Figure 1), astrometric follow-up was started post-peak for each event. The authors fit an astrometric lensing model to their data, not all of which were taken under good observing conditions. Figure 2 shows the results of the fit: all three targets are consistent with linear motion within the uncertainties of their measurements, i.e. no astrometric microlensing. Nonetheless, as photometric microlensing is still present, the authors used their astrometric model combined with a photometric lensing model to back out various lensing parameters, the most important one being the lens masses. They found one lens to have comparable mass as a stellar-mass black hole, although verification would require future observations. Despite not detecting astrometric microlensing signals, the authors demonstrated that they achieved the precision needed in a few epochs; had the weather goddess been on their side during some critical observing periods, some signals could have been seen. This study is also the first to combine both photometric and astrometric measurements to constrain lensing event parameters, ~20 years after this technique was first conceived. For now, we’ll give stellar-mass black holes a break, but it won’t be long until we catch up. Totally fed up with your use of the WordPress button for reblogs. I got RutgersResearch to use the standard reblog button. It absolutely fixed this problem. With the WordPress button, your identity does not come through to the reblog. With the standard reblog button, you come through very well plus more of your text, not just the link to your article. Get with it and do this.